May 27, Shenzhen, China, MakeFashion Edu, a creation founded between fashion tech nonprofit MakeFashion and maker education community center SteamHead, hosted its first tech fashion walk in Design Society’s Sea World Arts & Culture Center. 20 teams of young designers from local and international backgrounds made fashion tech pieces that were shown in the event. Fashion tech is the combination of fashion and applicable technologies, ranging from adding LED lighting to innovative prosthetics. SteamHead co-founder and MakeFashion Edu’s managing director Carrie Leung puts emphasis on the community building focus of the event, saying, “this [event] is a maturing step for the community on the whole; what truly has made this all special and worthwhile has been all that has happened in the buildup to it.” This ties in directly with her definition of what it means to be a maker – someone curious; a problem solver; willing to collaborate and not afraid to try. 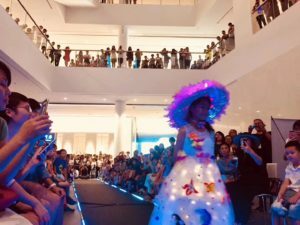 In the buildup to the event, SteamHead offered and organized resources and people, collaborating with Shenzhen’s MG Space and passionate educators and industry leaders to run fashion tech workshops. These workshops were designed to provide access to tech and fashion knowledge, tools, and resources for all participating teams, as well as being open to any interested members of the community free of cost. Shenzhen based designers from all ages and backgrounds made up the 20 different teams. Young designers included Bai Shuyu, 7, from team ElecFreaks; and Gracjana Siewert, 17, from Poland. Prior to MakeFashion Edu’s call for designers, very few of the participants had an opportunity to work with the tech that they would eventually incorporate into their final pieces. For this reason, “workshops were key”, says Leung. Workshops were often targeted at mentors, who were able to trek the long distances to reach wherever that week’s workshop was to be hosted. Mentors would then pass on what they had learned about electrical circuits, programming, and fashion tech design techniques to their teams. Soldering stations, bundles of wires and LEDs, and microprocessors like the micro:bit and KittenBot were stowed by SteamHead’s workshop leads into backpacks with glue guns, scissors, and fabric to be taken by foot, by bike, and by bus from workshop to workshop. It was then up to the young designers to creatively apply what they learned. For mentors and producers, the event represents potential. “It’s a spark,” says Leung. With over seven years of experience working in fashion tech, Hoover has story after story of people who have changed their careers after seeing what is possible in the field. A constant example for him is the story of Dolphin, who found freedom of expression in fashion tech from the confines of her engineering job. His goal is to increase exposure and the inspiration that keeps him driving forward are the stories that are expressed through each piece, he said. A broad range of inspirations drew designers to the event. Nicole Xu was looking for a new experience that might bring new perspective to her life when joining MG Space team, Silent Weaver. Silent Weaver teammate Tina Jiang finds real joy in designing and making, and hopes that an event like this might inspire other girls to design and make as well. Mentor Barbara Grotowska of Shenwai Longgang International School, saw first-hand team Las Florecitas and Super Makers work through the often complex process of compiling their ideas together, sketching designs, then fulfilling certain roles to create their final pieces. Compelled by the designer-led aspect of the MakeFashion Edu event, she worked primarily to foster an environment where making mistakes was okay. In this way, Grotowska encouraged teams to draw upon their personal interest and pride to create something beautiful, rather than being compelled by a grade. Aisling Yue, vice manager of MG Space, saw the event as a way to get more girls involved in making. Yue said that she often sees people coming to their maker space and vocalizing all the potential it had for their sons, overlooking their daughters that stood present. Here, Yue sees opportunities to practice core skills of self-expression and problem solving slipping by girls. 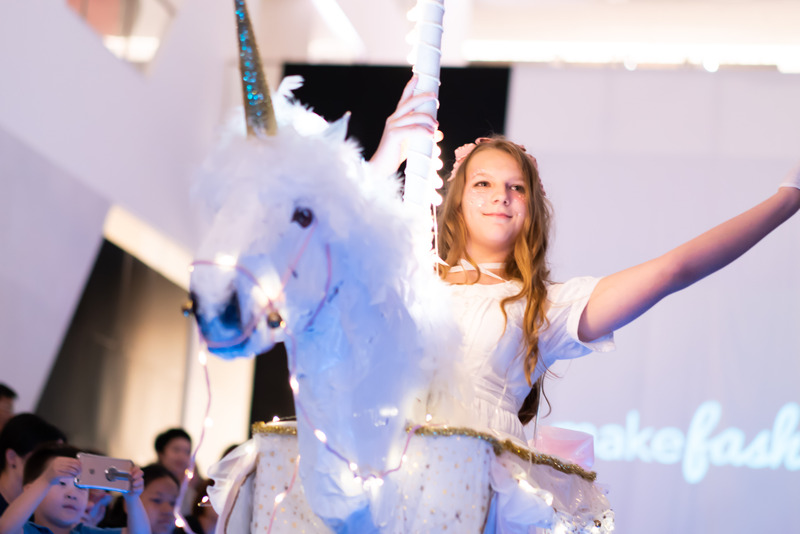 She instantly saw this event as an excellent way for the world to see how and why girls can and should be participating with tech and the maker movement. Managing director Carrie Leung said that community has been the core idea driving her efforts. Not only through the process of organizing the event; reaching out to many different schools and organizations for participation; and, funding and leading workshops through her community platform at SteamHead; but, she also stresses the importance of self-expression. “That’s because community starts at valuing people first”, Leung said. To that end, she’s worked to make MakeFashion Edu a platform for these stories to be seen and heard. As weeks then months progressed, designers went from tinkering to drafting; to sewing, soldering, and programing; then, to final touches and final repairs as each of their pieces made their way to the Design Society building in Sea World, Shekou. Over three days, models went through two rehearsals, a professional photo shoot, and the agonizing stress of worrying about tripping on the runway. Then, the sun began to set, the lights were dimmed, the venue was overflowing to the second floor balcony, and the video introducing the first piece was playing on the projector screen hanging at the start of the runway. While the audience watched the story of the first piece’s conception and construction unfold on the projector, Shannon Hoover stood watching it only waiting for it to break to logo, when his hand would then go from the model’s shoulder to pushing them toward the runway, forward. And there, three months of hard work and dreams would be realized. Magic bled into the moment. Walking slowly, hand in hand, designers Athena Hu and Molly Li of team Moralture, moved in steady harmony down the runway, stopping to wave and bow slightly before turning and moving on in unison. They were all at once two princesses, taking a stroll on a cool, moonlit evening. Audience members melted, stealing pictures, and broke into applause, not once, but three times as the pair of friends shared their story of the friendship that holds them together. Cloak drawn across his face, superhero Black Wolf, worn by Ben Huang from SLIS, stepped to the start of the runway, revealing his glowing armor and silver clows with a toss of his cape. The audience erupted into applause. It was the burliest security guard, afterwards, that looked nine years old, smiling with enthusiasm next to Black Wolf as Huang’s parents helped them snap a picture. Slow and deliberate, greeting the surrounding audience left then right like a magician, Liang Jingyuan of Yucai #4, drew us into his sphere. With a whoosh of his cloak, his magician’s ball was revealed and held to the sky. Eyes followed it back down as his hands began to motion across the surface, drawing the light out from within. As his expression became more focused and clear, the more people watching suddenly believed that here was a wizard. Concluding the show was Gracjana Siewert, 17, who worked independently to design her piece, Carousel. As Melanie Martinez’s Carousel played, Siewert moved slowly across the runway, pulled by a gentle rotation, swaying from her unicorn mount with a drag of fingers through the air. Slowing down the incandescent moment and drawing on all of the elegance of old-time carnivals, the audience was drawn into a beautiful, tragic, nostalgic moment Siewert had composed.